Coral Bay is home to the majestic Manta Ray, most tours in Coral Bay such as the Whalesharks and Humpback Whales are seasonal, but you can swim with these manigicent ocean creatures all year found in Coral Bay. We have two companies which operate tours specifically to swim with the Manta Rays. 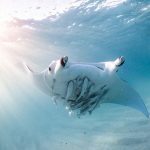 Before you read on about the companies in Coral Bay, here are some cool facts about the Manta Rays made available from Ningaloo Marine Interactions. There are two species of Manta Ray, the Coastal Manta Ray (Manta alfredi) and the Oceanic Manta Ray (Manta birostris). MantaTrust.org based in the Maldives provide a great guide to the morphological differences between the two. Ningaloo is visited by both species, the most common coastal manta ray which is the focus of tourism at Ningaloo, can reach a wingspan of nearly 4.5m and is resident to the reef whilst the larger more elusive and highly seasonal oceanic manta ray has been reported to attain sizes in excess of 7m. The unique oceanography of Bateman Bay collects food and provides appropriate habitat and access for manta rays throughout the year. Manta rays visit this bay for three main reasons including to feed, to be cleaned of parasites and dead skin by wrasse at places known as cleaning stations, and to seek mating opportunities. Manta ray visitation although year round at Ningaloo does appear to be linked to the seasons, with large numbers of new and seldom seen animals appearing when food abundance is high and fewer numbers of commonly seen animals present when their food is less abundant. Manta rays are planktivorous, feeding almost exclusively on planktonic crustaceans, such as crab larvae and copepods. The conditions within this bay allow us to interact with mantas in shallow,clear, safe water, making it perfect for snorkelling, without the need to be dive certified. Join our dedicated team for a half day ecointeraction tour to search for, and where possible snorkel with, the majestic Manta Ray. We use a spotter aircraft to assist us in finding the best Manta Rays to interact with. These magnificent creatures have a wing span of around 4 metres and are completely harmless… an underwater dance with a Manta Ray is one of life’s greatest experiences! Your day will include snorkelling amongst beautiful coral gardens and the chance of observing other wildlife including turtles, dolphins, dugong, humpback whales (seasonal) and more! 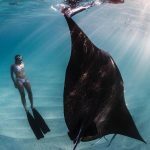 We pride ourselves on delivering you a memorable and informative day on the Ningaloo Reef, gaining a greater respect of all things Manta Ray with minimal impact on this fragile, pristine environment. We offer you the chance to participate in research and give you the opportunity to name any newly discovered Manta Rays! Tour includes: Snorkeling gear, lunch, coffee and tea. Experience this unique opportunity to snorkel up close with our resident population of these amazing creatures. Our prices include a certified Divemaster or Instructor guiding you at the dive sites, our spotter plane used to search for the Manta Rays, lunch and refreshments throughout your tour including tea, coffee and fresh water. Snorkeling with manta rays, 1 snorkel or SCUBA dive on the reef. Rates: Adult $145.00 Child (6 – 16yrs) $90 Family (2A & 2ch) $430 – Divers: Divers tanks and weights only $190, Divers all equipment supplied $210, Discover Scuba Diver $275. Time: Half Day tour meeting at 8.30am and returning around 1.30pm. Tour includes: All of your equipment is supplied including wetsuit, mask, snorkel and fins and includes light refreshments.